Bountiful and Beautiful: Skinner’s January Fine Art Auctions Feature Fresh-to-Market Works | Skinner Inc.
Robin S. R. Starr, Vice President and Director of American & European Works of Art, notes that in addition to a broad selection of pre-20th-century material, the auction offers an especially robust quantity of modern and contemporary work in all categories. “The market is hungry for this,” Robin says, and that hunger can be satisfied with selections that are affordable for beginning collectors, as well as masterworks for the advanced connoisseur. A considerable number of items are from private collections and fresh to market, including notable examples that have descended in the families of the artists or original owners. ♦ David Hockney, Lightning (Lot 78, $7,000-9,000) One of several Hockney prints referencing the phenomenon of lightning, it is strikingly different from the colorful images more commonly associated with this multi-faceted artist. ♦ Roy Lichtenstein, The Art Critic (Lot 88, $25,000-35,000) is a late work, at a point when the artist was playing off his own previous works and also looking back at the art of the earlier 20th century. This intentionally Picasso-esque version of an iconic Lichtenstein girl is retrospective in more than one sense. ♦ Pablo Picasso himself is richly represented. Lot 100, Femme au char triumphal ($40,000-60,000) and Lot 101, Le joueur de diole ( $35,000-55,000) are unique hand-painted terra cotta tiles. The sale boasts a strong group of his turned ceramics as well. ♦ Frank Weston Benson (Lots 18–25, Estimated between $600-1,800). Benson’s close observation of the natural world is both timely and timeless. These pieces make the work of a major American artist available at very attractive prices. Additionally, there are works by Paul Klee, Helen Frankenthaler, Frank Stella, Robert Rauschenberg and—literally—too many other important artists to list. ♦ Alfred Stieglitz, The Two Poplars, Lake George (with The Dying Chestnut Tree) (Lot 162, $8,000-12,000) reflects the photographer’s shift from a Pictorialist to a modernist “straight” aesthetic, while also revealing the subject of trees and nature as sources of personal meditation. ♦ André Kertész, Distortion 166 (Lot 161, $5,00-7,000) is one of a series of nudes photographed with mirrors and special lenses to create surreal distorted images. 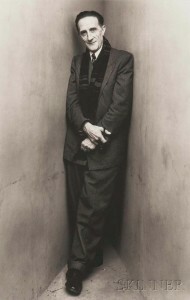 ♦ Irving Penn, Marcel Duchamp, New York (Lot 181, $15,000-25,000) This platinum print (made in 1979 from a 1948 negative) is one of Penn’s famous studio wall “corner” series of portraits, important for its size and subject as well as its intrinsic artistic appeal and innovative use of a starkly simplified background. ♦ Sally Mann, Untitled (Lot 196, $8,000-12,000) Mann is best known for her photographs of her young children and husband on their family farm in Virginia. This work represents another of Mann’s abiding interests: the Southern landscape haunted by the presence of history. ♦ Ivan Aivazovsky, Along the Coast, Capri (Lot 265, $130,000-190,000). This leading Russian romanticist, influenced by Turner, was especially well known for seascapes and was hugely successful in his own lifetime. ♦ Philippe Maliavine, Russian Peasants Singing (Lot 404, $150,000-250,000). Born into a poor peasant family, Maliavine (Malyavin) became a noted portraitist and international success. 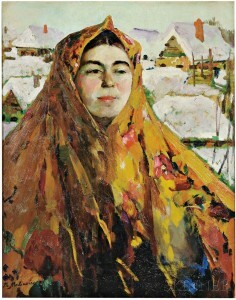 He combined Russian Impressionism and traditional folk themes in his paintings of colorful large-scale peasant figures. ♦ François Angiboult, Cubist Still Life (Lot 442, $10,000-15,000) Behind the French masculine name was Hélène, La Baronne d’Œttingen, a Polish aristocrat married to a Russian officer. Hélène was an important member of Parisian avant-garde culture in the early 20th century. ♦ Jean-Baptiste-Camille Corot, Portrait de Madame Langeron à 4 ans (Lot 244, $100,000-150,000). The wistful little girl holding her doll is an unexpected subject for the artist most famous for landscapes. ♦ Marino Marini, Two Figures and a Horse (Lot 435, $40,000-60,000). In both his paintings and his sculptures, equestrian themes were pre-eminent in the Italian modernist’s work. ♦ John Singer Sargent, Lady Poole (Lot 373, $50,000-70,000). The artist came to prefer informal and intimate charcoal drawings like this to the full-length, sumptuously dressed portraits for which he is best known. ♦ Aula Magna (Lot 438, $25,000-30,000), a gouache, pencil, and ink drawing for an installation in the auditorium of the Universidad Central de Venezuela. Working with the architects and sound engineers, Calder designed a system of suspended and fixed large panels that were successful both acoustically and aesthetically. ♦ Profils (Lot 439, $70,000-90,000), gouache and ink, is a lively portrayal of a circus act. It re-caps the themes of balance and movement central to all Calder’s work, especially his sculptures and mobiles. 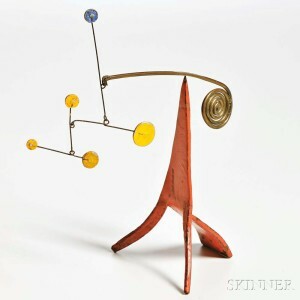 ♦ Untitled, Standing Mobile (Lot 440, $150,00-250,000) is a moving sculpture that, while less than six inches high, displays the engineering skill, artistic genius and wit for which Calder is renowned. This entry was posted in News and tagged Alex Katz, Alexander Calder, Alfred Stieglitz, American art, art, auction, boston, Contemporary Art, David Hockney, Dürer, Edward Weston, Ernst Haas, european art, fine art, fine art auction, fine photographs, Frank Stella, Frank Weston Benson, Helen Frankenthaler, Ilse Bing, Irving Penn, Ivan Aivazovsky, John Singer Sargent, Josef Albers, Manuel Alvarez Bravo, modern art, Nan Goldin, Paul Klee, Philip Guston, Philippe Maliavine, Photography, Piranesi, Ray K. Metzker, Rembrandt, Robert Rauschenberg, Roy Lichtenstein, Russian art, Sally Mann, skinner, skinner auctions, Ukrainian art by Skinner. Bookmark the permalink.